Just a reminder that all of my non-financial blogs have been folded into one. Foldedspace is back! But you won’t find it here. Instead, head on over to the new Foldedspace at jdroth.com. Hey, loyal and patient Foldedspace readers. As many of you know, I’ve been doing some soul-searching over the last few months. The end result is that I want to become more focused in my writing, and to pursue my passions with, well, passion. That means there’ll be lots of little changes in my life, most of which are visible only to me. My new personal blog. After nearly a decade at foldedspace.org, I’m moving my personal site to jdroth.com. The stuff here won’t be going away, but there won’t be anything new published. Instead, the new stuff is over yonder. I’ll gradually move the “best of” the old stuff over there, too. As I work to mold my life into what I want it to be, my aim is to write much more often for Foldedspace (which is still the name of my blog at jdroth.com). I miss writing about non-money topics. I miss interacting with my friends and family. I miss the glory days of Foldedspace. I know I’ve made noises like this before, but mostly failed to follow through. Fingers crossed that this time I make it happen. Come on over to Foldedspace 6.0 to join the conversation. I promise to post lots about cats and comic books and movies and our garden. And I won’t talk at all about money! Our neighborhood isn’t exactly quiet. Well, it’s quiet most of the time, I guess. But on evenings and weekends, there are a lot of people outside laughing and shouting. There are also a lot of people playing their music. The renters in the brown house across the street like to blare KGON and its classic rock. Curt and Tammy next door like contemporary country music. Behind us, Harvey and his girls tend toward oldies. In a way, it’s fun when one of our neighbors has the music on at high volume. I wouldn’t normally choose to listen to any of these types of music, but I don’t hate them. Plus I feel like this gives me a glimpse into their world. I even contribute to the din from time-to-time. If I’m working in the yard, I’ll turn up the workshop stereo. My music of choice is usually the two-disc Johnny Cash anthology (though I’ll often play big band or new wave or Indigo Girls). I’m sure the neighbors are sick of “Five Feet High and Rising” by now. All is well and good in our noisy little world. Or was good until the other neighbors behind us joined the fray. We think that the little red house is being rented by some college students. They seemed to move in during the late spring, during which they held loud bonfire parties well past bedtime on weeknights. No big deal. Easy enough to wear earplugs. They listen to gangsta rap and bad hip-hop. Ugh. Call me an old man, but this is like a torture one might devise for terrorists. Fortunately, I spend my days up at the office. If I were working from home, I might have knocked on their door to complain by now. I still may have to do so. We’ll see. Or maybe I could make a request. Everything would be fine if they’d just play Johnny Cash. I was digging through some old e-mail when I came across a request to update my gigantic list of goals. On my 38th birthday, I wrote about the 101 things in 1001 days project (which I learned about from dienu.com). I drafted my list of 101 goals on 25 March 2007, and then provided a single update on 01 January 2008. It’s now been 839 days since I made the list. How am I doing today? Perhaps unsurprisingly, I’ve done well with my financial goals. I’ve met them all. In fact, I’ve exceeded my goals by a wide margin. I haven’t done as well here. In fact, I haven’t done well at all. I think the contrast between this list and the first list demonstrates that what gets measured gets managed. The things we focus on are the things we excel at. 6. Complete a marathon keep getting injured during training! I did a little better with this list, though I still have many goals left to accomplish. I actually think I could finish some of these in the four months that remain of my 1001 days. 14. Get a rug or carpet for the library getting close! I made great start on this list, but haven’t done much on it recently. I really do need to purge my record collection, for example. And though I no longer want to sell all of my comics, I do need to organize my collection. Wow. I haven’t even tried to do anything on this list other than the two interview items — and that’s because those come up in the course of my GRS activities. I need to do more here. 6. Give a good radio interview I can do this on a regular basis now! Again, I haven’t done enough here. One of the things I crave is adventure, but I only talk about it. I never put my words into action. The Wii bowling is no longer a priority, though I’m still making slow progress on the movies. Yay for Netflix! Before I started Get Rich Slowly, I was actually interested in making money from photography. I was making good progress, too. This list of goals reflects the fact I hadn’t yet abandoned those dreams. Now I have. Not bad progress here, but not as much as I’d hoped. I spend most of my time reading personal finance books! Although I haven’t diversified my writing activities, I can’t say I’m disappointed here. I write a ton, and nearly every day. I haven’t sold a magazine article or published a book, but a book is in the future, I think, and I’ve contributed to three other personal finance books, so that’s a start. I now know that some of these will never be accomplished. Setting up other web sites? Not going to happen. I don’t consider this a failure — it’s just a shifting of priorities. And I’d now rather beat “Super Samurai” on Dance Dance Revolution than bowl 300 at Wii Sports. I may not achieve everything I set out to do, but I’ve done a hell of a lot over the past couple of years. As much as I make fun of little Nemo, I have to admit he’s our fiercest hunter. Mostly he hunts his sister Toto (which makes her hiss) and his brother Max (which makes him growl). But he also likes to hunt other critters, especially baby birds. 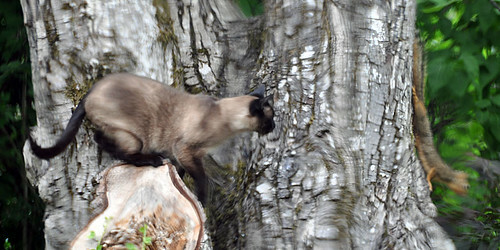 Perhaps his favorite prey, however, is the squirrel that lives in the walnut tree. He hasn’t caught Walnut yet, but that doesn’t stop him from trying. I’m not sure Nemo is actually serious in his squirrel hunting, though. And I’m not sure that Walnut is serious about escaping. The pair of them spent about five minutes in a cat-and-mouse game (well, cat-and-squirrel, I guess), but neither seemed willing to follow through. Walnut, for example, could have dashed up the tree at any time. He didn’t. Instead, he’d often creep closer and closer to Nemo. For his part, Nemo could have tagged Walnut during a couple of these moments — he was easily within paws’ reach — but he didn’t. Nemo and Walnut were content to jockey for position. What broke this stalemate? One of our resident crows* came along to break things up. He landed on a nearby branch and began to caw at the two combatants. (Or are they playmates?) Nemo decided that he was no match for squirrel and crow, so he retreated to the picnic table. * This year, Rosings Park is home to a family of crows. Or something. These crows don’t behave like any crows we’ve ever seen. They come down to eat at the feeder. They drink from the birdbath. They interact with the other birds. And, as I just mentioned, they play a role in the goings-on around the yard. 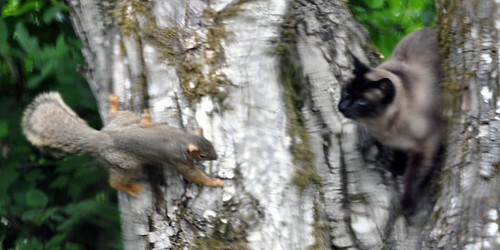 (I mean, really: Breaking up a fight between a cat and a squirrel? Why?) We have no idea how long the crows will stick around, but it’s fun to have them. As I say, I watched this a few months ago, but dismissed it as a novelty. But I’ve thought about the video many times since. I love the way it captures so many small moments. Because I have sleep apnea and spend my nights strapped to a C-PAP machine, I don’t dream very often. If I remember to take my melatonin before bed, I’ll sometimes have dreams, but mostly my nights are a blank slate. (I’m sure I’m actually dreaming, of course, but I just don’t remember the dreams upon waking.) A couple of weeks ago, though, I had a fine pair of dreams. Very vivid. Kris and I were joining Chris and Jolie to see a movie in northwest Portland. For some reason, we were meeting them at the Mini dealership in southwest Portland. When we met, there was an hour before the movie began, so I suggested we walk over to the theater. We did. As we were leaving the dealership, we passed through a coffeeshop attached to it (which doesn’t exist in reality), and I accidentally knocked a newspaper from some lady’s hands. Chris caught it as it fell, and I was all apologetic. The four of us walked to the (imaginary) theater in northwest Portland, but we were way early (which wouldn’t be true in real life — the walk would have been just the right amount of time). Fortunately, the theater was attached to a large used bookstore (not Powell’s). Also fortunately (or perhaps unfortunately), the bookstore contained a huge stash of comics-as-books that I’ve been hunting for. And for cover price (instead of marked up at collectors prices). I was ecstatic, and set aside a stack of them to purchase. Then I saw that my brother Jeff was there. He and I began to talk. Jolie came to tell me that it was time for the movie to start, so I went to find my stack of books, but they were gone! I was frantic! I didn’t want to let these bargains slip away. I couldn’t find them anywhere. I looked under a bed (why was there a bed in the middle of a bookstore?) but they weren’t there. (There were, however, other comics-as-books that I wanted, so I grabbed them.) Ultimately, I had to leave without my books, and I was very sad. I did not enjoy the movie. The four of us are coming out of a building (the theater in dream #1?) and we see a puzzling sight. We’re in southeast Portland now, over by Woodstock and 39th. All of the buildings are shifted off their foundations. In fact, most of them are collapsed and demolished. “Was there an earthquake?” we keep asking the people, but they’re wandering around in a daze and not answering us. Chris and Jolie go their own way while Kris and I ride the bus (?!?!?) home, looking at the devastation as we ride. “I wonder if our house has collapsed,” I say, but we decide that it probably hasn’t because the foundation is embedded deep in the earth (not true). When we get home, the house is fine, but all of the houses around it have collapsed. There’s a little white house that lives up the street. It’s a small house on a small lot, but otherwise I think it’s kind of cute. I’m not sure that anyone lives there right now — the yard certainly isn’t maintained. 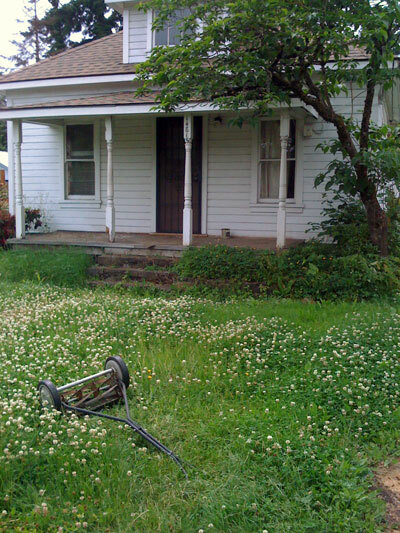 For the past couple of weeks, there’s been a manual reel mower sitting in the front yard. It was sitting upright, as if somebody had stopped in mid-mow, but eventually it fell to the ground. The grass has been growing up around it: the hunter has become the hunted! Yesterday, however, I noticed that the mower had been moved. It was ditched at the top of the hill in somebody else’s yard. Someone — probably a kid — had wheeled it a few hundred feet and then discarded it. “I ought to put it back where it belongs,” I thought. But I didn’t do it. That’s okay, though. This afternoon as I was walking home, I noticed that the mower had been returned to the exact position from which it had been taken. That, my friends, is neighborliness! 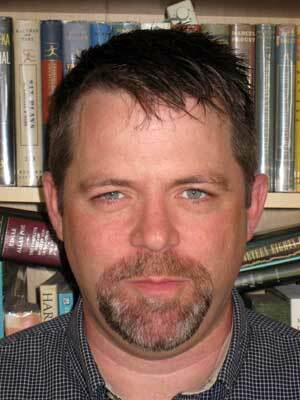 Out of sheer laziness, I’ve begun to get my hair cut at Great Clips. It’s right next to Safeway, so it’s easy to go there when I’m picking up groceries. I don’t particularly care for their cuts, but Kris likes them. They generally give me the same cut every time, too, which is nice, because they’ve put my preferences into their computer. Today, however, I got something…a little different. When I walked in, I was pleased to discover there was no wait. Alexis was able to cut my hair right away. “How would you like your hair cut?” she asked, which I thought was odd, since the info is right there in the computer. “So you want about half an inch off the top?” asked Alexis, holding up my hair to illustrate. It was about two inches long. Alexis began to fuss with her implements. “I hate this chair,” she told me. “It’s too far away from my stuff. My cord won’t reach.” To make things work, she had to spin me around so I was facing the back of the shop. We chatted briefly, but not much — just the way I like it. “Do you use product?” Alexis asked a few minutes later. “Would you like me to put some in your hair today?” she asked. “And do you part your hair?” she asked. O, my fragile heart. What could I do, though? I tried not to look shocked, thanked her, and left a two-dollar tip. I walked over to Safeway to do my shopping, but the whole time I felt mortified, as if everyone were snickering at my new hair. “It’s not so bad,” Kris said when I got home. How could she say that? For years, she’s been refusing to let me get a short haircut. And now I have one by accident and she likes it? It makes my head look like an enormous melon! “It’s really not so bad,” Kris said again. “I almost don’t want to go to the party tonight,” I said. I went, and Kris was right. (Kris Gates is always right, isn’t she?) Nobody said a thing about my hair. But I know that they were snickering on the inside!